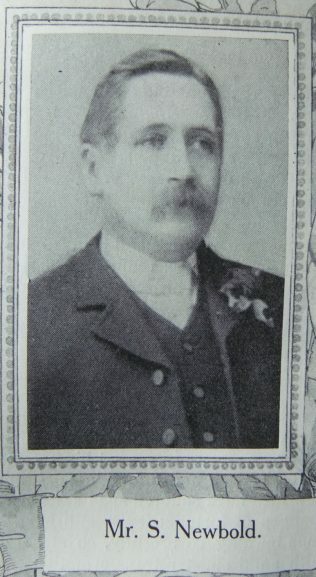 Mr. Samuel Newbold, the Senior Steward of the Ashby-de-la-Zouch Circuit, has had a life-long connection with our Church at Moira. He was one of a number of earnest young men whose sturdy character and unstinted service have done much to make this cause – in its early days almost crushed by debt and despondency – one of the strongest village interests we have in the Midlands. Mr. Newbold is best known as a capable and successful local preacher. He began to preach when but seventeen years of age, and for twenty-six years has been rendering efficient and much appreciated service in his own and neighbouring Circuits. He loves preaching, and has given his strength of mind and heart to the holy task of proclaiming the evangel of God’s grace. Now in the very prime of life we trust there remain for him many years of joyful service and ever widening and deepening influence. Samuel was born in 1867 at Moira, Leicestershire, to parents Samuel and Elizabeth. Samuel, senior, was a collier. Samuel followed his father as a coal miner. Samuel married Sarah Ann Moore (1867-1915) in late 1887 in the Ashby-de-la-Zouch Registration District. Census returns identify six of nine children. Samuel married Susan Elizabeth Tebbett, nee Finch (1877-1957) in early 1920 in the Ashby-de-la-Zouch Registration District. Samuel died on 19 October 1928 at Burton-on-Trent Infirmary, Staffordshire.